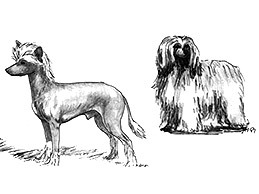 A small, active and graceful dog; medium to fine boned, smooth hairless body, with hair on feet, head and tail only; or covered with a soft veil of hair. Slightly rounded and elongated skull. Cheeks cleanly chiselled, lean and flat, tapering into muzzle. Stop slightly pronounced but not extreme. Head smooth, without excess wrinkles. Distance from base of skull to stop equal to distance from stop to tip of nose. Muzzle tapering slightly but never pointed, lean without flews. Nose a prominent feature, narrow in keeping with muzzle. Any colour nose acceptable. Head presenting graceful appearance, with alert expression. Lips tight and thin; An ideal crest begins at the stop and tapers off down neck. Long and flowing crest preferred, but sparse acceptable. Jaws strong, with perfect, regular scissor bite, i.e. the upper teeth closely overlapping the lower teeth and set square to the jaws. Rump well - rounded and muscular, loins taut, stifles firm and long, sweeping smoothly into the well let-down hock. Angulation of the rear limb must be such as to produce a level back. Hind-legs set wide apart. Hare-foot, narrow and long. Nails any colour, moderately long. Socks ideally confined to toes, but not extending above top of pastern. Feet turning neither in nor out. No large patches of hair anywhere on body. Skin fine grained, smooth, warm to the touch. In Powder Puffs coat consists of an undercoat with soft veil of long hair, veil coat a feature. Weight varies considerably, but should not be over 5.4 kg (12 lbs).